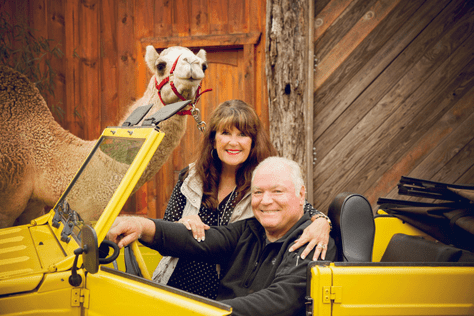 For over 30 years, Bill and Linda Goldner have been fulfilling their mission to provide evenings of family fun and Christian entertainment on the shores of Grand Lake. In 1985 they built the 1000 seat amphitheater where they have presented original Biblical dramas and Christian concerts. “The Man who Ran”, the story of Jonah, Jesus and the great fish, written by Bill, has been the recipient of numerous awards including the Redbud merit award for “outstanding attraction” . The next two shows: “The Elijah Factor”, about the prophet Elijah and his encounters with the wicked Queen Jezebel and her husband King Ahab and “Damascus Road”, how Saul became Paul were both written by Linda. With a heart for youth, they added Christian concerts to the entertainment. Over the last several years the artists included Audio Adrenaline, Group One Crew, Seventh Day Slumber, Manic Drive, OBB, Jonathan Thulin, and Sanctus Real. Bill and Linda have been blessed with 5 wonderful children plus 12 grands. If you look close enough, you may see most of them in the show.